The BHASVIC field has been booked for the annual St. Luke’s Church and Prestonville Community Association Barbeque for Sunday 12th July. Setting up will begin at about 10.30 am and cooking will start at about 12.30 pm. Everyone is welcome, just turn up on the day. Contributions of food and drink would be much appreciated. Has anyone locally experienced difficulty negotiating the corner of Exeter Street just by the Chimney House ? The placement of bike racks just by the parking ticket machine and the tables is making life just that little bit more difficult when pushing the buggy. Add to this the drinkers enjoying the sun of an evening or a couple of builders vans and things just get more onerous. 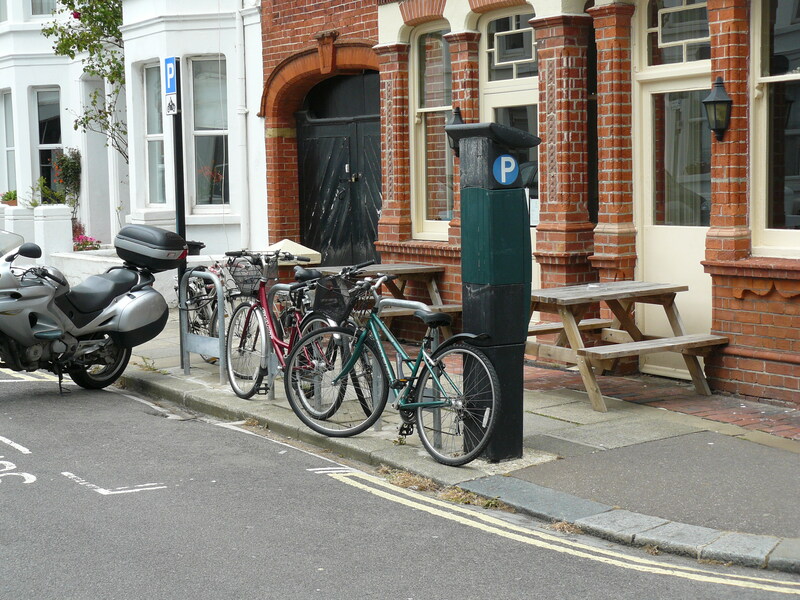 If there is local support, we may be able to get the bike racks moved……. I’m Sgt Chris Lane and as of 5th May 2009 I took over as the sergeant for the Neighbourhood Policing Team covering your area. Although new in post, I’m no stranger to neighbourhood policing and prior to being promoted in 2007 I was on this team as a PC for over 3½ years. I have a small but dedicated team of three PC’s and eight PCSO’s. The PCSO’s are assigned a specific geographical area and the PCSO for your area is Erica Harkness who I hope you all know. My area of responsibility includes Saunders Park, Hollingdean, Fiveways, Preston Park, Prestonville, Withdean and Westdene. Pending a further vacancy being filled, I am also temporarily covering Hollingbury, Patcham, Coldean and Stamner. Quite a large area, I’m sure you will agree; however the team have an excellent knowledge of their respective beats and I have confidence in their abilities. I’m passionate about uniform policing and dedicated to providing a first class service for the community. The nature of police work is such that what we perceive as priorities often differ from those of the community: accordingly I invite you all to keep in regular contact with myself or Erica and tell us exactly what is on your mind. Likewise through these pages I will endeavour to keep you updated with information relevant to your area. As a driver who uses the Exeter St/Buxton/Upper Hamilton road junction, I am concerned that on a regular basis drivers are being forced to slow down or stop by virtue of children playing football etc in the road. Apart from the obvious dangers of them causing or being involved in an accident, their manner of playing could well cause damage to local properties and parked cars. Playing in the road is in fact an offence if it causes annoyance to residents or other road users, created as a bye-law by the local council. If the problem persists I will be reporting the problem to our neighbourhood policing team and would urge others to do likewise before the inevitable happens. Our local PCSO is Erika Harkness and can be reached on 0845 60 70 999. Collection day on Hamilton Road should be Wednesday. Dear neighbours – I have just spoken to the city council refuse team about our collections, particularly the poor reliability of collections on the notified days. I was really pleased to receive a phone call having only sent an email 30 minutes earlier. The reasons for this poor service remain unspecified. This week there has been a problem with a van but this hardly excuses so many months of irregularity. I was reassured to hear that the council is very aware of our specific problems (it is apparently related to three specific rounds). A sweeper will be dispatched within 24 hours to clear up any spilt bags and we will have a full collection by tomorrow (Saturday). Managers are looking into why our rounds remain a problem. I am still not satisfied but did appreciate some offer of understanding. I would really encourage everyone to keep emailing/phoning the council whenever there are problems as it is the only easy way of providing timely feedback.